O (Observation): The Law handed on to Moses, and subsequently observed by God’s people throughout the ages, is called upon here in a peculiar way. The Law is for those who are outside of righteousness. That’s a difficult concept to grasp. Aren’t we all sinners? Yes. But maybe Paul reminds us that the Law is a set of boundary markers that helps us to understand where to draw a line regarding our actions in the world. And another complication is this: if we are part of the community of faith, don’t we still have some accountability to the law? Yes, we do. Perhaps Paul is stating that the Christians that Timothy hangs with can point to the law in order to help those outside of the faith – to give them a plumb line, to borrow an OT image. And in doing so, God’s people will see that they are set free from the worries of the law (they have salvation already), in order to serve God and their neighbor (and worry about their own salvation less and less and more about the salvation of non-believers). A (Application): I get so uptight bringing up my faith when talking to non-Christians. I don’t want to judge, but I know some things we do in this are wrong – they don’t give God glory. My comfort zone is to share about my story and why I do what I do. I don’t throw that on others, just myself. We have to be careful here. I think it’s almost too bold for Paul to call others “ungodly and sinners”. That’s not because I just want everyone to feel nice. I just don’t think it’s my place to call them out. I do use the phrase “non-believers” as a way to talk about people who do not subscribe to the Christian faith. But my stance is that I’m still called to witness to them through my words and actions. And perhaps that’s my takeaway this morning. God is calling me to live the life of a disciple, and as God calls people to me, I can work with them in ways of discipleship. I can help people transition from only knowing the law, to becoming a gospel-oriented person. 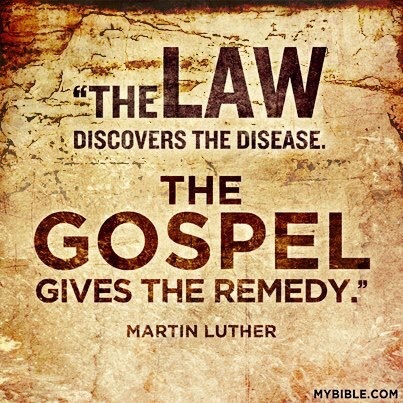 The transition from law to law & gospel is indeed freeing…but at the same time, keeps us in check. P (Prayer): Lord, see us through a transition from law to law & gospel. Help us to know that you call us to be responsible and yet free in this world. Helps us to see the clarity of being a servant of all and yet free. Amen. This entry was posted in Digging Daily and tagged Free, Gospel, Law, Saint, Servant, Sinner. Bookmark the permalink.